Position in a Nutshell: Depth in the upper minors, athletes in the lower minors, and not much in between. Quite thin beyond a handful of top players with a lot of low-floor, projectable young players. Are things a bit crowded in the upper minors? Yup, especially now that Grady Sizemore has emerged as the club’s starting major league center fielder, pushing Jackie Bradley to Pawtucket when everyone on the major league roster is healthy. Of the team’s top four outfield prospects, three—Bradley, Bryce Brentz, and Alex Hassan (pictured)—will patrol the same outfield, at least once Shane Victorino gets healthy. Add free agent signee Corey Brown, who had a great spring training showing, and the club will at least have sufficient depth for Sizemore and Victorino. But after that, things look pretty barren. What happened? Yeah, after that loaded Triple-A group, things tail off pretty quick, with Manuel Margot the only marquee name. There are a number of reasons for this. Looking at outfielders of note who would still be prospects in the system, the club has traded Reymond Fuentes (2009 – 1st) and Brandon Jacobs (2009 – 10th); Williams Jerez (2011 – 2nd) and J.C. Linares (2010 – IFA) have not panned out; and Peter Hissey (2008 – 4th) has been unable to stay healthy despite showing flashes. Players like Keury De La Cruz (2008 – IFA) and Henry Ramos (2010 – 5th) have also not elevated themselves above sleeper status. More recently, the club’s drafts have done little to re-stock the coffers in the outfield, with the only outfielders signing from the 2012 draft being football players (Shaq Thompson, Brandon Magee), and the outfielders selected in 2013 were of the high-ceiling, low-floor variety. 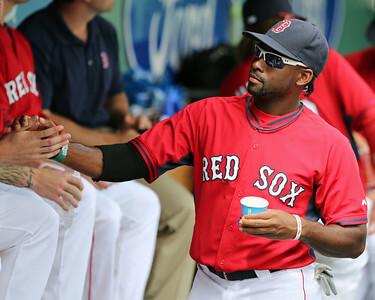 Top Prospect: Jackie Bradley, Jr., Assignment: Boston – Even though Bradley had his struggles at the big league level, his future projection did not change—he still profiles as a well-above-average defensive outfielder who will hit enough to profile at least as a bottom-of-the-order bat, or potentially a number two hitter. Bradley will add the most value in center field, where his elite instincts allow him to get great reads on the ball and take excellent routes despite his speed only grading out as average. Defensively, Bradley is close to a finished product, but he still has things to work on at the plate. Bradley has an excellent approach and contact skills, though he can get a little pull happy and as a result have the tendency to roll over pitches, resulting in weak contact to the right side. At his peak, Bradley could be a plus hitter, but at present he is only a fringe-average to average hitter. He does not have much present power or power potential, but he could settle in to hitting 10-15 home runs per year. Bradley is still one of the top outfield prospects in the game and should play an important role with the big league club this season, despite losing out to Sizemore for the starting center field job. That said, more time in Pawtucket will not hurt him either once he heads back to Triple-A. Stock rising: Alex Hassan, Assignment: Pawtucket – After making a slight mechanical change last season that improved his timing and the leverage in his swing, Hassan put up an impressive .321/.431/.460 line in Pawtucket. With no room on the big league roster—particularly with the emergence of Sizemore—and with less than a full season of at-bats at the level due to injuries in 2013, Hassan will return to Triple-A looking show the improvement was no fluke. Hassan has a great approach and pitch recognition skills, but his bat speed does not stand out and, as a result, plus velocity has given him trouble in the past. Defensively, Hassan has a corner outfield profile with a plus arm, but his below-average speed limits his range. 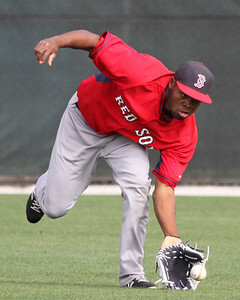 Hassan also played some first base last season and showed decent hands at the position. He did not play the position until late in spring training, but that versatility should help ease the logjam in the Pawtucket outfield. If Hassan can put together another solid season, he will position himself next year as an internal option to fill one of the open bench spot or platoon spots on the big league roster. Sleeper: Manuel Margot, Projection: Greenville – Though not technically a sleeper given that he is a borderline-top 10 prospect, with a solid season, Margot break not only into the top 10, but put his name on the national radar. Margot is an excellent athlete who has solid defensive tools, but at the plate he has a long way to go. Margot has already started to fill out his frame and has seemed noticeably more physical each season. He is a plus-to-better runner and should hold that speed for the long haul. At the plate, Margot has tools, but the total package is raw at present. He has quick hands, plus batspeed and good separation in his stride. The major issue comes with his approach, as Margot is ultra-aggressive, swinging at anything close to the strike zone. He also struggles to recognize secondary offerings, often getting caught out on his front side as he commits early to try to get out in front of fastballs. At present, Margot only has gap power, but during Spring Training this year he showed the ability to drive the ball to all fields and should develop some pop as he matures. Defensively, Margot gets strong reads and uses his speed to easily close on the ball. His arm is fringy, but he has a center field profile and could settle in as a plus-to-better defender if his tools come together. Greenville should provide a good test for Margot as his first foray into full-season ball, where the pitching will force him to make adjustments that he did not have to in his stateside debut last season with Lowell. At a crossroads: Bryce Brentz, Assignment: Pawtucket – Brentz had something of a down year last season, struggling with injuries and a continued lack of plate discipline. He profiles as a corner outfielder defensively, so while the power has always been there, he will have to be more consistent in his approach and with the hit tool to tap into that power and profile as a regular. This season could be a make-or-break season for Brentz to prove whether or not he is a potential future starting option for the Red Sox (or some other major league team). Brentz was added to the 40-man roster this past offseason, so he will have to prove he is worth the roster spot. If he performs well, he should be in line to receive his first big league call up this season, but if not, others could pass him on the depth chart and he could be stuck in Triple-A all year. Henry Ramos, Projection: Portland – Hit tool and approach will be tested in the high minors, but power has developed consistently as his frame has filled out and he has adjusted to playing baseball full-time. Keury De La Cruz, Projection: Portland – Has solid-average-to-better batspeed and plus raw power, but his swing is extremely violent and his overall approach at the plate is still rudimentary. Struggles to recognize off-speed pitches and his hit tool is still well below-average. Poor defensive profile, best suited for left field. Kendrick Perkins, Projection: Greenville – An over-slot signee in the sixth round back in 2010, Perkins has shown plus raw power in batting practice, but it has yet to translate into games. He struggles with pitch recognition and has too much swing-and-miss in his game. Bryan Hudson, Projection: Lowell – Has plus-plus speed from the left side and an athletic frame. Very limited present power, but decent contact skills. 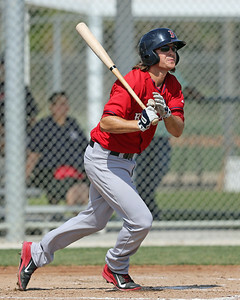 Jordon Austin, Projection: Lowell – 2013 draftee is an excellent athlete, but has a long way to go to translate that athleticism into production, especially at the plate, where he put up a .198/.324/.276 line last year in 116 GCL at-bats. Jervenski Johnson, Projection: GCL – Has a strikingly tall, projectable frame and is very athletic, but he extremely raw on the diamond. Was headed to college to play football prior to signing with the Red Sox as an undrafted free agent. Was apparently injured during spring training and not participating in drills. 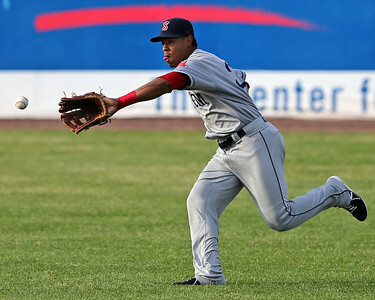 Yoan Aybar, Projection: DSL – Athletic outfielder received a $450,000 bonus last July. Reports have his defensive tools well ahead of his offensive tools at present. Things are thin enough between Portland and Greenville that there were apparently no cuts following Spring Training. 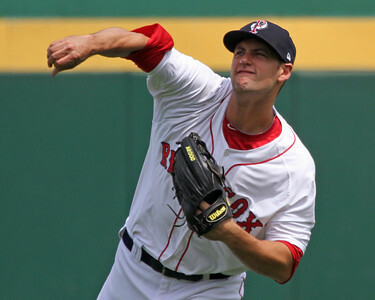 Bradley's call-up following Victorino's injury thinned the crowded Pawtucket outfield. There's room for more outfielders at the short-season levels. Photo credits: Alex Hassan, Jackie Bradley, Manuel Margot, Henry Ramos, and Peter Hissey by Kelly O'Connor.